Penguins are snowy birds that survive in some of the harshest environments known to man. But not all of them live in a winter wonderland! In PENGUIN HOSPITAL you'll meet Africa's only penguin. Called the African Penguin, their chosen habitat along the South African coastline puts them in direct conflict with man as well as nature. These bubbly birds are living in one of the busiest cities in South Africa - Cape Town. They cause chaos wherever they waddle in the busy streets, and, through interactions with man and beast, their future is threatened. Fortunately, a team of dedicated heroes has stepped in to help. Known as Africa's busiest emergency department for penguins, the Penguin A&E (short for accident and emergency) rescues more than 1,500 vulnerable penguins every year. Their work is never-ending. Operating 24/7 to rehab these precious penguins, with TLC, the team works hard to get them back to the wild where they belong. Loraine Kelly meets employees at South Africa's busiest penguin emergency department. 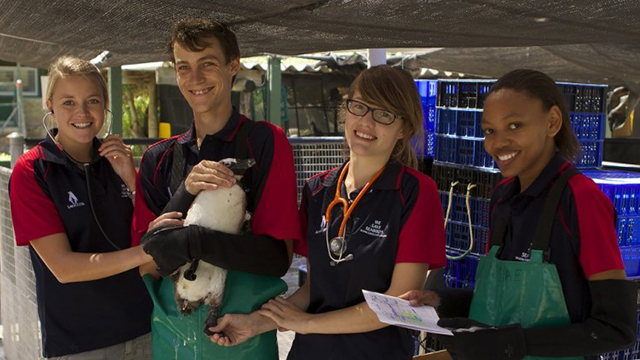 The hospital rescues more than 1,500 vulnerable penguins every year, and works 24/7 to rehabilitate them. In the first episode, vet Natasha is faced with a case involving a feisty penguin with a fish hook in its stomach. The team must use their expertise to save Bandit's life in an operation never attempted before. The team in Cape Town must act quickly when a penguin is rushed to hospital after a suspected shark attack. Meanwhile, ranger Yvonne visits Betty's Bay to check on the birds nesting in dangerous areas. Lorraine follows the journey of Little Bruiser, a penguin that is taking too long to shed its feathers which has also been recently attacked by a seal. Vet Bronwyn tries to save a penguin found at Stony Point colony with a life-threatening leg injury. This is a common occurrence among the birds, as demonstrated by Pogo, who came in two months ago with a badly dislocated foot and has been fitted with a splint to help him walk unaided. Meanwhile, staff work tirelessly to save one-day-old Alfie, who was born dangerously underweight, while Lorraine meets some of the hospital's long-term inhabitants - and even gets to name one of them. Breeding season arrives, and ranger Minette witnesses a battle for love at the Boulders Beach colony, the likes of which no one has seen before. At the chick-rearing unit in Cape Town, three, flea-ridden chicks are rushed in from Robben Island. The unit is full to capacity already, but it's all hands on deck as the staff try to keep these tiny abandoned siblings alive. With only one foot and serious health issues, penguin Colin's physical condition is so bad that many would give him up as a lost cause, but somehow rehabilitator Marna is going to try to get him home. In the delightful mini-series PENGUIN HOSPITAL, hosted and narrated by Lorraine Kelly (Good Morning Britain), you'll follow some of the cheekiest and most lovable penguins on the planet, as they fight for their lives in tropical South Africa.